This app serves as an on-the-go companion piece to the book Confidence to Care: A Resource for Family Caregivers Providing Alzheimer’s Disease or Other Dementias Care at Home. 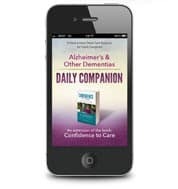 The book combines personal stories with the same practical tips available through the app to help family caregivers confidently deal with the most common issues associated with Alzheimer’s disease and other dementias. This book combines personal stories with practical techniques drawn from decades of caregiving experience from family caregivers, professional CAREGivers℠ within the Home Instead Senior Care® network, and internationally recognized experts. Buy the book on Amazon. All profits from this book will be donated to the Home Instead Senior Care Foundation and designated for dementia-related organizations and causes. Confidence to Care also highlights the importance of family caregivers caring for themselves while caring for others.